Already familiar characters in countless sci-fi movies, humanoid robots are well on the way towards stepping off the silver-screen and into daily life. But before they can move in as helpers and companions, man-shaped machines have to get a grip on the human world, learning to handle even the most fragile objects with care. “This is the iCub – it’s a humanoid robot that has been developed by an European consortium. It’s the size of a child, and can be used to study cognitive tasks,” explained Alexander Schmitz, a Ph.D student at the Italian Institute of Technology in Genoa. 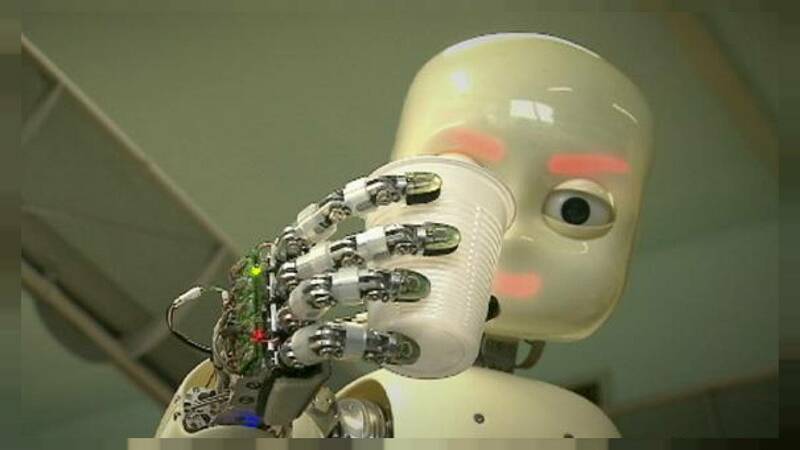 Using its new artificial skin, the iCub can measure and control the pressure exerted by the fingers - even though its hand is easily strong enough to crush the plastic cup. The coordinator of the ROBOSKIN project, Giorgio Cannata, said: “Robots have been used for a long time, just in industrial applications where interaction with humans was not a task. “Now we believe it’s time to think of robots that can interact with humans for different kinds of tasks where the roles of humans and robots are both important – like in the domestic environment or for therapeutic operations. The iCubs, assembled in the Italian Institute of Technology in Genoa, are the guinea pigs in a European research project aimed at giving robots a sense of touch. And a sense of touch goes hand-in-hand with a sense of feel. At the University of Hertfordshire, just north of London, they have been teaching their robot to differentiate between the feel of a friendly pat and a hostile punch. They hope it could help to treat autism. “KASPAR is a minimally expressive robot, how we call it; what this means is that it’s a child-sized robot that is specifically designed for human-robot interaction, in particular more playful interaction,” explained Kerstin Dautenhahn, Professor of Artificial Intelligence at the university. Scientists believe autistic children who have trouble communicating with other people might feel more comfortable with a robot’s predictable reactions, leading to a better understanding of how interpersonal communication should work. The seemingly natural reactions to physical contact are triggered by patches of artificial skin embedded under KASPAR’s face and clothes. The soft, flexible sensor elements are wired to the computer that constantly interprets pressure patterns, triggering his movements in response. Just how closely a socially-acceptable robot should mimic the appearance and behaviour of a living person is a controversial question that the scientists believe should still be closely researched. iCub and KASPAR owe their new-found abilities to these capacitive touch sensors. It is just one of several pressure-detecting technologies that are being tried and tested within the ROBOSKIN project. Giorgio Metta, a senior researcher in the Cognitive Humanoids Lab at IIT in Genoa, demonstrated the system. It is easy to glue the mesh of triangular sensor elements over large areas of the robot’s body. After being covered with silicone foam the capacitors can measure the pressure difference when the thickness of the soft layer changes. But combine a sense of touch with others – like vision – and a robot’s capabilities can be multiplied many times over. Playing ball might seem straightforward enough, but in fact it needs extremely complex hand to eye coordination. But with some well placed sensors robots need not feel left out of the game. Team leader in Genoa, Lorenzo Natale said: “This robot is using information about the colour and shape of the object, so it’s able to identify the ball and compute the position of its centre and size. With this information it determines the distance and directs its hand. “In this experiment, we use the tactile feedback to decide when the fingers should stop grasping the ball. Robot skin might have a long way to go before it can match its ultra-complex human counterpart. But already electronic elements are providing machines with a halfway decent substitute for the human sense of touch. And in the end, that should make it safer and easier for robots to take their place in an ever-changing human world.